Junior forward Will Trawick dribbles past a defender. Trawik notched a career-high 27 points in the Eagles’ victory over LaGrange College (Ga.) last Saturday. 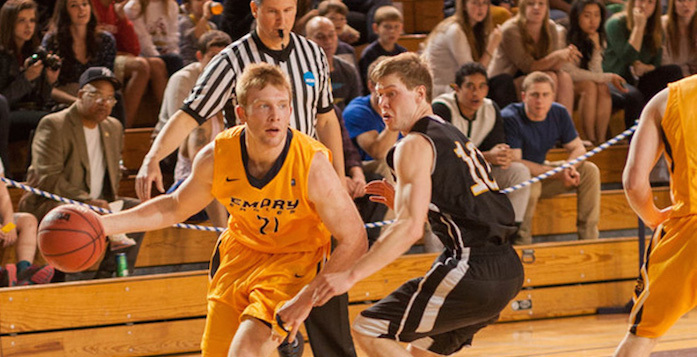 Photo Courtesy of Emory Athletics. The men’s basketball team continued their winning streak with a 65-52 topping of LaGrange College (Ga.) last Saturday. The Eagles’ win improves their record to 3-0 on the season. The Eagles outshot the LaGrange Panthers with a field goal percentage of 47.7 over LaGrange’s 30.9 and a three point percentage of 55.6 over the Panthers’ 21.4. The Eagles also outrebounded the Panthers with 43 rebounds to LaGrange’s 41 and notched 20 assists to LaGrange’s six. However, LaGrange outperformed Emory in free throw shooting, scoring 80 percent to Emory’s 45.5, and the Panthers had less turnovers with 13 against the Eagles’ 18. Junior forward Will Trawick led the Eagles’ scoring effort, leading the Eagles with a career-high 27 points. Senior forward Alex Foster had another solid week, scoring 15 points with junior guard David Rao and senior point guard Michael Florin also scoring in the double digits with 10 and 11, respectively. Trawick attributes his successful game to his taking advantage of recent practices. While the Eagles had a solid game offensively, they continued to fall short of their high defensive standards. “We weren’t rebounding well and had too many turnovers,” Zimmerman said. Junior guard Mark Wagner, junior guard Braxton Ford, senior forward Jordan Johnson and senior guard Nick Mitchell lead LaGrange with double digits scoring 12, 11, 10 and 16 points respectively. The game was one of the more festive of the year, with many parents of the athletes coming to the game.